There is a continued — and in some cases rising — need for skilled strategic thinkers and communicators to manage functions that computations cannot, as well as to interpret and apply output from tech solutions. Digital transformation emerged prominently in 2017 as a critical business focus, according to the Benchmarking Accounting and Finance Functions: 2018 report from Financial Executives Research Foundation (FERF) and global staffing firm Robert Half. Over half of the financial executives surveyed in the United States (59 percent) and Canada (52 percent) said they will maintain their current staffing levels due to digital transformation. Seventeen percent of U.S. respondents and 22 percent of Canadian respondents are proactively adding to their teams over the next 12 months to address digital transformation needs. Organizations are automating processes for functions such as invoicing, data collection, report generation, document storage and compliance. Some firms also expect to automate financial planning and forecasting through predictive reporting within the next three years. Competency in data analytics shows the greatest demand. Nontechnical skills such as communication and collaboration are also coveted by employers today. The use of cloud-based solutions continues to rise. Seventy-five percent of U.S. respondents and 73 percent of Canadian respondents are currently using or planning to deploy these services in the future. More than half of the U.S. and Canadian firms surveyed still rely on manual processes for accounts reconciliation, but those percentages are declining. The report is based on survey responses from more than 1,700 leaders in accounting and finance departments at public and private companies, mainly in the United States and Canada. About one-quarter of individuals (22 percent) identified themselves as CFOs. Two-thirds of respondents are from private companies, while 14 percent work at public companies. Eighty-four percent of respondents said their company’s annual revenue is under $500 million. 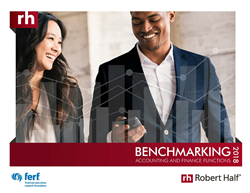 The report can be obtained at http://www.financialexecutives.org/benchmarking2018 and http://www.roberthalf.com/benchmarking. Financial Executives Research Foundation (FERF) is the non-profit 501(c)(3) research affiliate of Financial Executives International (FEI). FERF researchers identify key financial issues and develop impartial, timely research reports for FEI members and nonmembers alike, in a variety of publication formats. FERF relies primarily on voluntary tax-deductible contributions from corporations and individuals, and publications can be ordered by logging onto http://www.financialexecutives.org/Research.aspx. Financial Executives International (FEI) is the leading advocate for the views of corporate financial management. Its more than 12,000 members hold policy-making positions as chief financial officers, treasurers and controllers at companies from every major industry. FEI enhances member professional development through peer networking, career management services, conferences, research and publications. Members participate in the activities of more than 65 Chapters in the U.S. and a Chapter in Japan. FEI is located in Morristown, N.J. Visit http://www.financialexecutives.org for more information. Celebrating its 70th anniversary, Robert Half is the world’s first and largest specialized staffing firm and has more than 300 staffing locations worldwide. The company’s professional staffing divisions include Accountemps, Robert Half Finance & Accounting, and Robert Half Management Resources, for temporary, full-time and senior-level project professionals, respectively, in the fields of accounting and finance. Robert Half is also the parent company of Protiviti, a global consulting firm providing solutions in finance, technology, operations, data, analytics, governance, risk and internal audit. Visit http://www.roberthalf.com for more information.